Mix egg white with sesame oil in a small bowl. Reserve. Bring chicken broth to a boil in a large pot over high heat. Add corn kernels, bring back to a boil, then lower the heat and simmer for 15 minutes, uncovered. While the soup is cooking, prepare the rice vermicelli according to the manufacturer’s instructions. Usually, plunging the vermicelli in boiling water for 1 or 2 minutes will suffice. 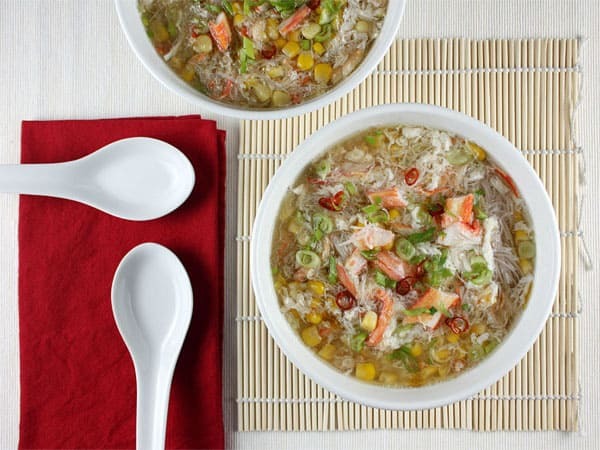 Divide the softened and cooked rice vermicelli in 4 individual bowls. Back to the soup: add Chinese cooking wine (or Sherry), soy sauce, ginger, salt, pepper, sugar and cornstarch. Bring back to a boil, then lower the heat to low. Add crab meat, stir, then pour in a thin stream the egg white and sesame oil mixture, mixing continuously. Divide the soup between the 4 serving bowls. Sprinkle with sliced green onions, thinly sliced red pepper, and a couple of drops of toasted sesame oil. Serve very hot. 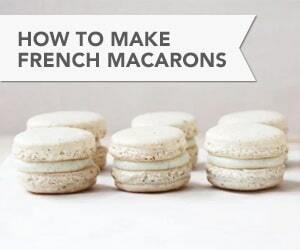 Recipe Credit: Adapted from Ken Hom, via Chatelaine Magazine.